If you’re wondering how to change your religion in Conan Exiles, then you’re in the right place. It’s actually possible to convert to or worship more than one god in the game for free, but only if you talk to the right people. In this guide we'll take you through how to change your religion in Conan Exiles. When you're first getting started, the game allows you to choose one religion out of the 4 that are available. These religions are Crom, Set, Mitra, and Yog. If you decide that you wish to change this selection or even worship all 3 (Crom cannot be converted to since he's a god that requires no worship), you can do so without spending any knowledge points if you’re able to find the priest or priestess of the designated religion you’re trying to learn. Mek-kamoses can show you how to change your religion to Acolyte of Set. The God of Set rules serpents and poison. In order to gain his favor, you must prove you've committed a human sacrifice by offering a human heart to his altar. Set will then grant you powers such as resistance to poison and the sacred skill of turning snakes into arrows. 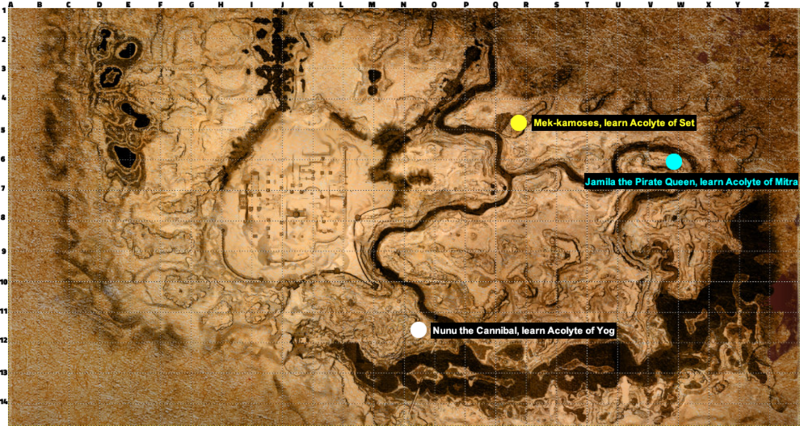 If you travel to Q:4 of the map (view map below), you'll find Mek-kamoses near a giant temple surrounded by poisonous spiders. Here you can ask him to teach you the ways of Set. Jamila the Pirate Queen can show you how to change your religion to Acolyte of Mitra. Mitra is the Goddess of right and justice but the means in which her followers convert others can be considered a bit over-enthusiastic. In order to gain her favor, you'll have to bless the bodies of your slain enemies with the Mitrean Ankh. This will provide you with the essence of their soul which you can bring back as a gift to her altar. She provides loyal worshippers with a number of holy items. 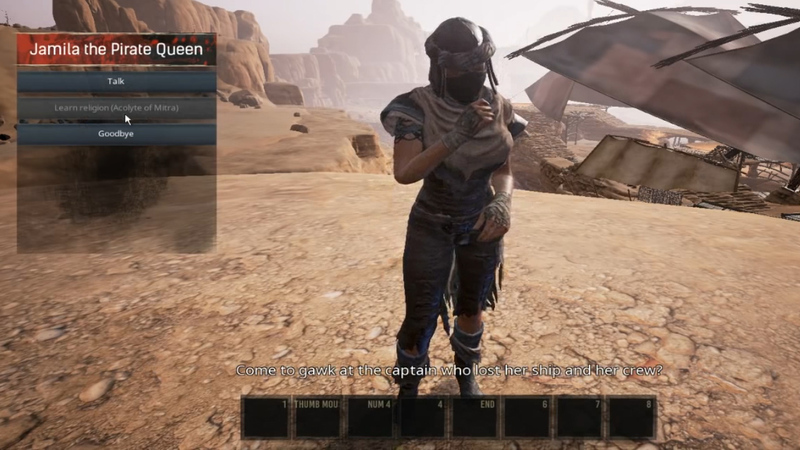 To begin practicing Mitra, you can find Jamila hanging out near a cliff overlooking a pirate ship in V:6 of the Conan Exiles map (view map below). Nunu the Cannibal can teach you how to change your religion to Acolyte of Yog, who is the God of cannibals. In order to get in Yog's good graces, you'll have to bring back a piece of immaculate human flesh to one of his alters. To retrieve the flesh, you must use a cleaver and then cook it in the pit of the Yog temple. This ritual will please Yog who will then provide faithful followers with enchanted armor and weaponry. In order to follow the path of Yog, you'll have to travel to N:12 of the Conan Exiles map (view map below) to find Nunu. 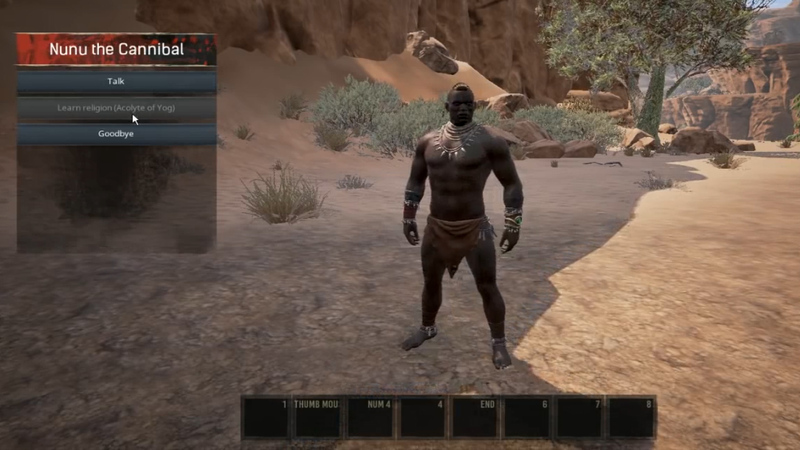 Conan Exiles is an open-world survival game that's still in Early Access. More content is expected to come out for the game, including more Gods and Goddesses. When they do, we'll be sure to update this article with the locations for each. Until then, many players have found it to be extremely beneficial to worship all 3 or a combination of the Gods/Goddesses since they each provide access to unique recipes, armor, and weapons. You should now know how to change your religion in Conan Exiles, so be sure to check out our guide on how to find iron and build up your settlement by learning how to enslave thralls.